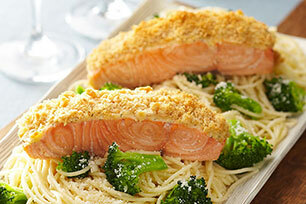 Two is better than one, so make this salmon recipe to share tonight. Wow your guest with your culinary skills! Mix Miracle Whip, mustard and dill until blended. Place fish in shallow ovenproof dish; drizzle with lemon juice. Cover with Miracle Whip mixture and cracker crumbs.